There is tons of advises out there on how to mix, DIY and steep your ejuice, you just have to go with the one that matches your equipment, deadlines etc. At the beginning I used to just put the plastic bottles in the Owen at the lowest temperature for a few hours, even tried microwaving but that melted the plastic bottle after just 6 seconds so that´s not the way. Anyway, lots of people using what they call a crock-pot method to speed steep their ejuice, mening they put a pot with water on the hob with low temperature to keep the water hot but not boiling, and lets the ejuice heat up in glass-bottle standing in the water. 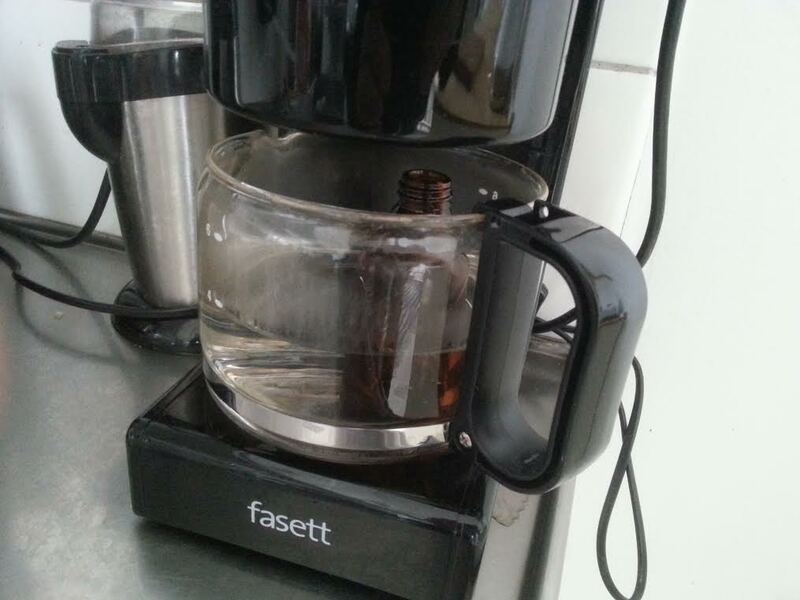 So I gave that some thought and find out that I had an old coffeemaker collecting dust i could use for this, so I dusted it off, put a glass bottle with newly mixed ejuice in the coffee-pot along with some water and let the coffeemaker keep it hot for about 5 hours.